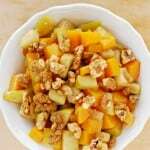 Put butternut squash and apple pieces in pan. Whisk together olive oil and maple syrup or maple flavoring. Drizzle over butternut squash and apple pieces. Bake at 375 for 15-20 minutes or until squash is tender. Stirring every 5 minutes. Sprinkle with sea salt and top with candied walnuts.